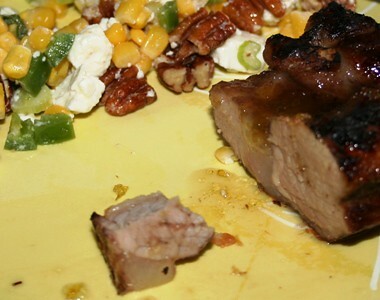 ribs and corn salad, originally uploaded by All Things Mimi. Earlier this week, Dev and I made one of the best dinners we've had in a long time. I love it when we both contribute something to the meal. Dev made jalapeno jelly glazed ribs. I wish I could tell you the recipe, but it is filed away with the secret squirrel "wooing" recipes in a vault somewhere. I know that he braises them for a few hours in a highly seasoned liquid, then cools them, glazes them with his home made jalapeno jelly, and puts them under the broiler until they are crusty and delicious!! My contribution was a corn salad. I substituted pecans for the walnuts, but other than that I made it just like the recipe read. Oh my gosh was this good. Very spicy and sweet, with some saltiness from the feta and some crunch from the toasted pecans. This will definitely make it into the regular rotation!! !